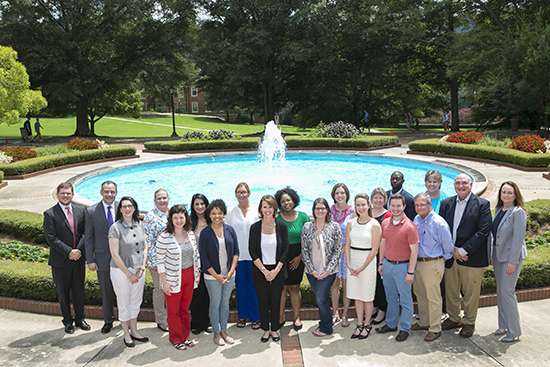 Samford University’s Cumberland School of Law welcomed its first class for the new Master of Science in health law and policy (MSHLP) degree at an orientation on campus Aug. 21-22. Students of the online program met with faculty, administration and fellow students. Health care professionals from the Birmingham area joined the group to share expertise and answer questions. The class of approximately 20 students from seven states includes a surgeon, nurses and nurse practitioners, health care administrators, lawyers, a priest and several recent college graduates. Although the group varies in age and background, the members share a common goal of increasing their expertise in the increasingly complex field of health law. Kathryn Andreolli, an in-house counsel for a large orthopedic practice in Lindenhurst, New York, said she anticipated getting better at her job through the program.“I hope to broaden my knowledge and understanding of compliance specific to health care providers and increase my understanding of health care delivery systems in general,” she said. The degree will be the first fully online program offered by the law school and the first degree program for non-lawyers.With input from health law and compliance experts on campus and in the community, Cumberland School of Law was able to develop a curriculum that could earn accreditation from the Compliance Certification Board (CCB).Samford earned that accreditation and is one of only eight universities nationally to be accredited by the CCB.The accreditation will enable students to sit for one of four credentialing exams offered by the CCB upon graduation. Experienced faculty from the law school and Samford’s College of Health Sciences will participate in the program, as well as compliance professionals from the community.The program includes coursework in health law, regulatory affairs, public policy, insurance and health care administration, with an emphasis on health care compliance.The online program takes two years to complete. For information or to apply, go to samford.edu/go/healthlaw or contact Laura Tomlin, managing director, at laura.tomlin@samford.edu or 205-726-2543.